Well, we survived week 2 of Whole30. For me, this week was much more difficult than WEEK 1. I think maybe the lack of daily vanilla latte (all that sugar) may have taken a toll this week. I had a couple of killer headaches and a couple of moments of bad attitudes where I just really wanted a chunk of bread and a piece of chocolate. Which is weird for me because I've always been more of a salty person that sweets person. I'm blaming my lack of lattes again. Anyway, that said, the end of the week was much better. My energy was up, my attitude was much better and no more headaches. Oh, and my sleep has drastically improved! All good things. So on to the food. This week was full of leftovers and trying to find tasty ways to use them. Lunch: baked sweet potato with ground beef taco meat, salsa, cilantro, onion and "dump ranch"
Dinner: chopped green leaf salad topped with strawberries, carrots, onions, deli chicken breast, blueberries and a hard boiled egg with "dump ranch"
Lunch: at my parent's, my dad made pot roast with carrots, potatoes and green beans and a side of fruit salad! All things I could eat. My dad rocks. black coffee is working on me and I can really taste the difference between bad coffee and good coffee, my favorite coffee right now is Jamaican Blue from Sprouts. So smooth. since I can't really snack anymore, I've noticed my coffee consumption going up, I might need to work on that in week 3 and work more water in! I am sleeping like a ROCK. Every night. My sleep has never been so good. the halfway mark feels REALLY good. attitude is still everything. I had a pity party about not being able to go out anymore. 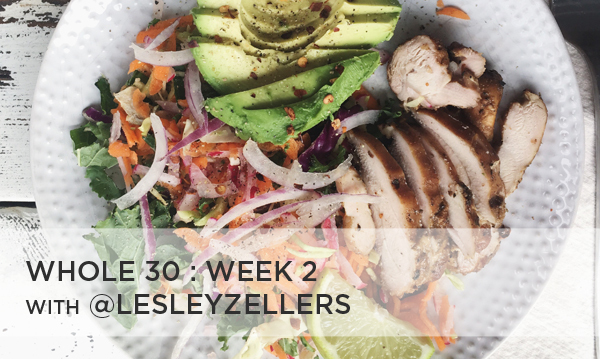 And not that we can't, I'm sure there are things we could order, but the main reason to do Whole30 was to keep us home more so we're killing it there - zero restaurants in 2 weeks. Whoop. But man, it sure would be nice to sit and eat chips and salsa and queso, drink a margarita and let someone else take care of the cooking and dishes! haha Trying not to focus on that. lastly, my workouts are better. I feel more energy to do them, better endurance and stamina. Oh, and I got a Foam Roller and it's everything. Thank you, sister, for talking me into that purchase!